Kingsman: The Golden Circle follows the members of Kingsman after the events of the original have already transpired. With their headquarters destroyed, the Kingsman discover a similar spy organization run by the U.S. These spies are known as Statesmen. The second film is named after the new villains the Kingsman face, a terrorist organization named, The Golden Circle. In the end, the Kingsman, working alongside the Statesmen, defeat the Poppy Adams, and the largest drug cartel that he led. There are only two returning actors from the original movie, The Secret Service. Colin Firth as Harry Hart and Taron Egerton as Eggsy are the two returning characters. The rest of the cast is composed of new villains and new Statesmen. The movie was directed by Matthew Vaughn and produced by Vaughn, David Reid, and Adam Bohling. Vaughn also worked on the movie’s screenplay. 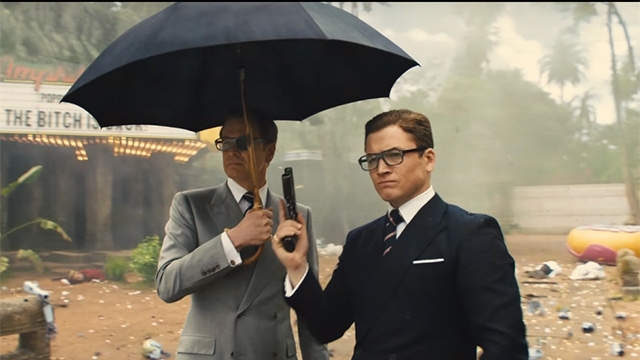 The movie is based on the Kingsman novels by Mark Millar and David Gibbons. The main cast includes Colin Firth, Julianne Moore, Taron Egerton, Mark Strong, Halle Berry, Elton John, and many more actors. The Golden Circle was released on September 22, 2017, in the United States. It had a $104 million budget, but brought in $123.2 million at the box office. It was filmed in both the U.K. and U.S. It received a 50% on Rotten Tomatoes, an IMDb score of 7.3/10, and 89% of Google users gave the movie a thumbs up. Around Ferguson, students had mixed reviews regarding the film. Some loved the group of elite secret agents as they took down terrorists and cartels, but some thought the movie was “unrealistic and a bit too much”. Ferguson cross country athlete and senior, Sebastian Lazo, said, “The movie was made up of everything I love, sarcastic comedy, suspense, mystery, and a lot of action.” He did say, however, that it did not live up to the original movie or cast. The Secret Service was the original Kingsman movie, and was released in December 2014. The movie’s budget was $81 million, but the box office brought in $414.4 million. It got 74% on Rotten Tomatoes, received an IMDb score of 7.7/10, and 92% of Google users gave the movie a thumbs up, statistically making the original movie superior. After much review, The Golden Circle, has had an overall positive feedback from its audience. It brought the excellent skills of secret spies, powerful villains, and two countries together in its 141-minute run. It’s a highly recommended movie for those who enjoy wit and conflict, and for those who are interested in the war against drugs and crime.